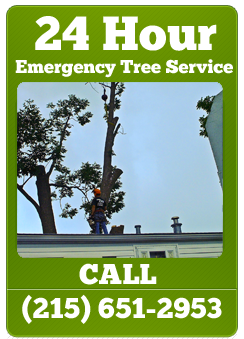 Sharp Cut Tree Care has professionals standing by 24 hours a day for your tree emergency needs. Sharp Cut Tree Care is always available to provide emergency tree service. Thunderstorms or ice storms can cause major damage to your trees. High winds or heavy ice can break tree limbs or topple large trees onto your property or even your home. Do you have a tree emergency that you need help with right now? Contact us and we will be there as soon as possible! Sharp Cut Tree Care specializes in assisting you during these hazardous conditions. We are available 24 hours per day, 7 days a week to help you with tree removal and clean up. Just call our 24 hour number, 215-651-2953. 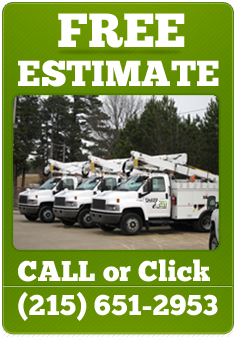 We can have an estimator at your home or place of business within 2 hours, and he can mobilize a tree removal crew on the spot. Our equipment operators and tree care employees are experienced in the delicate job of removing a fallen tree without further damage to your property. Sharp Cut Tree Care has over 15 years experience serving Bucks & Montgomery counties. We are a Fully Licensed Bonded & Insured tree service company, & are well known for our quality work, quick response & reasonable rates.